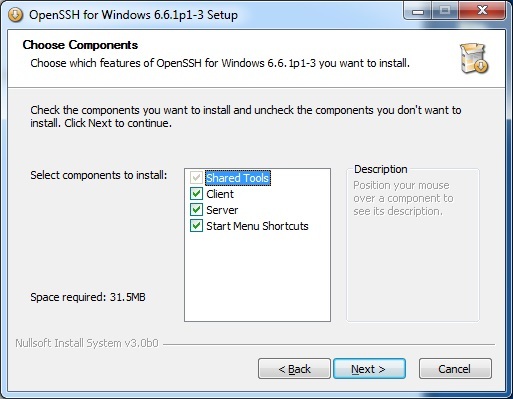 This website hosts a Windows installer package of Openssh for Windows that is actively maintained and current. The sshwindows package hasn't been maintained for a long time and is woefully out of date. I've been rolling my own versions of this installer for quite a while and figured others might find this useful as well. If you are looking for OpenSSH binaries for Windows 2000, XP, or 2003, head over to the OpenSSH installers for Windows 2000/XP/2003 page for links to the latest binaries that will work with those particular operating systems. If you are looking for older OpenSSH binaries that have been hosted on this site in the past, head over to the older OpenSSH installer page. 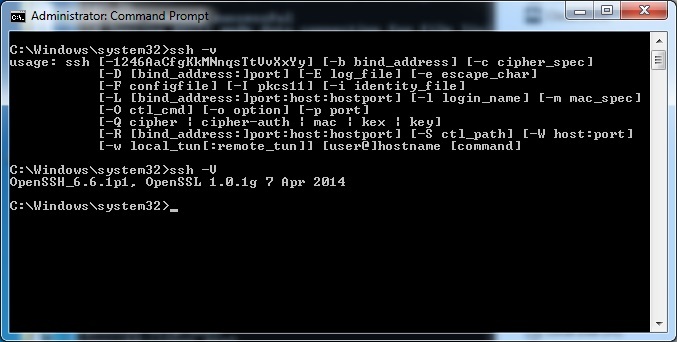 This is an updated OpenSSH 8.0p1-2 installer for both x86 and x64 binaries. I incorporated some suggestions from Bill S. Russian langauge translations added (anonymous contributor). Please note - for some reason the Chinese and Russian language translations aren't showing up in my drop down for languages. If anybody knows how to fix that...I'd take a hint. Also, the Russian language translations don't show up as Russian characters, I have strange symbols - as such, I don't know that the file I was provided actually is correct. Any Russian speakers care to review the Decriptions.nsi from the source file and provide some verification or update that would be appreciated. I use Notepad++ as my editor so please check out that file with that editor. Thanks! This is an updated OpenSSH 7.9p1-1 installer for both x86 and x64 binaries. No new languages this release - more languages would be welcome. This is an updated OpenSSH 7.8p1-1 installer for both x86 and x64 binaries. This is an updated OpenSSH 7.7p1-1 installer for both x86 and x64 binaries. Finally, this release includes language support for Simplified Chinese - more languages would be welcome. This is an updated OpenSSH 7.6p1-1 installer for both x86 and x64 binaries. There was a major change to this release - for security reasons the password associated with the sshd_server account is randomly generated (instead of D0ntGu3$$M3). You may change the password during the install process, but it was brought to my attention that many people probably weren't changing the D0ntGu3$$M3 password and that was of course a HUGE security risk. Finally, this release includes language support for Spanish and French - more languages would be welcome. This is an updated OpenSSH 7.5p1-1 installer for both x86 and x64 binaries. There was a major change to this release - for security reasons the server (sshd) MUST run with privilege seperation. As such, the installer and sshd_config file were updated to support this change. This brings with it a caveat - the installer has a default password for the sshd_server account (which is required for privilege seperation) - the password is D0ntGu3$$M3. YOU MUST PICK YOUR OWN PASSWORD FOR YOUR SYSTEM IF YOU ARE USING THE SERVER. I also changed the installer to install the server by default UNLESS you specify only the client via the installer or via a /clientonly=1 if you are using the command line switches. The rysnc command was also added to the binary directory. The final change was the removal of the pop-up windows that showed up during install - this change has been requested in the past and was requested again -- I have removed the windows as they just clutter things up. Finally, this release includes language support for German, Danish, and Portuguese (Brazil) - more languages would be welcome. This is an updated OpenSSH 7.4p1-1 installer for both x86 and x64 binaries. This release includes language support for German and Danish - more languages would be welcome. Includes a fix to the x86 install directory. This is an updated OpenSSH 7.3p1-2 installer for both x86 and x64 binaries. This includes a small fix to the uninstall $INSTDIR variable so a user selected installation directory is used (Thanks Jacob T for pointing out the error). This is an updated OpenSSH 7.3p1-1 installer for both x86 and x64 binaries. This includes a small fix to the silent install $INSTDIR variable so a user selected installation directory is not overwritten. This is an updated OpenSSH 7.2p2-1-v1 installer (no changes to the version of OpenSSH) for both x86 and x64 binaries. I included an incorrect cygwin1.dll for x64 builds causing both ls.exe and mv.exe to fail. This is an updated OpenSSH 7.2p2-1 installer for both x86 and x64 binaries. This is an updated OpenSSH 7.2p1-1 installer for both x86 and x64 binaries. I made a couple small tweaks - spaces are allowed in the service password and using large passwords should not cause a prompt. This is an updated OpenSSH 7.1p1-1 installer for both x86 and x64 binaries. I also took this opportunity to clean up the files to only the minimal dependencies. Let me know if you run into any missing file warnings. This is an updated OpenSSH 7.1p1-1 installer for both x86 and x64 binaries. The first point where you get to make some choices is the choose component dialog. 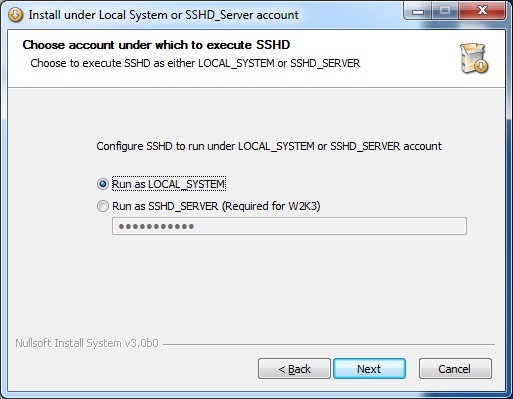 The next screen that requires some explanation is the "Choose account under which to execute SSHD". 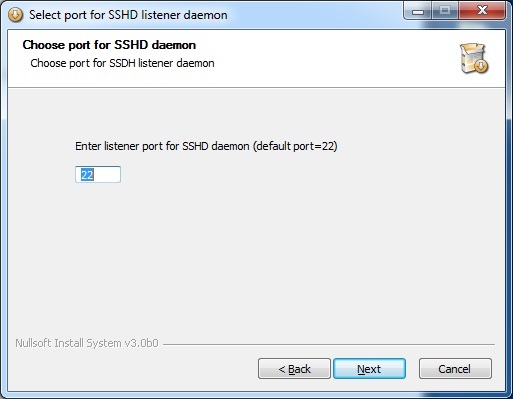 The SSH Daemon (SSHD) can run as either Local_System or SSHD_Server. If you are using Windows Server (2003/2008/2008R2/etc.) you will likely have to run this as SSHD_Server, however all others should be able to run this as Local_System. The default password that is filled in for you is "D0ntGu3$$M3" - I would recommend changing it! You can change this later by using the Services Control Panel. If you choose "Run as SSHD_Server", then you will be presented with the privilege seperation option. In general, it should be OK to not use priviledge seperation unless you are running Windows 2003. 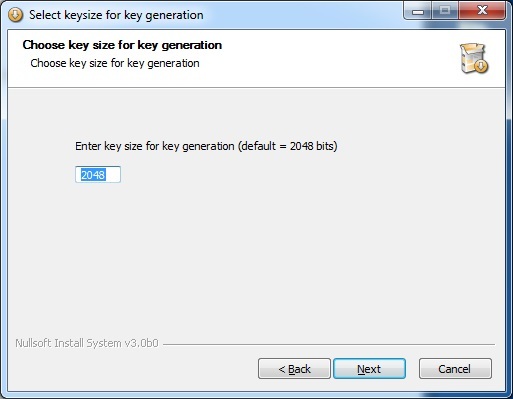 You may now select the keysize. The default keysize of 2048 is probably sufficient, however if you are truly concerned about your network privacy 4096 would be a good next choice. 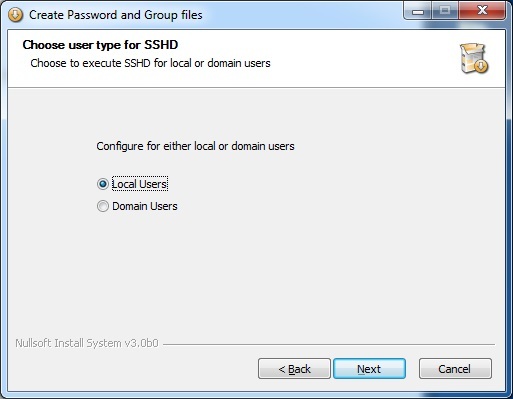 You can configure ssh for either local users or domain users. This determines how the password file is setup and you should probably choose Local users. OpenSSH will begin to install and configure itself for your system. which will show you the version information. 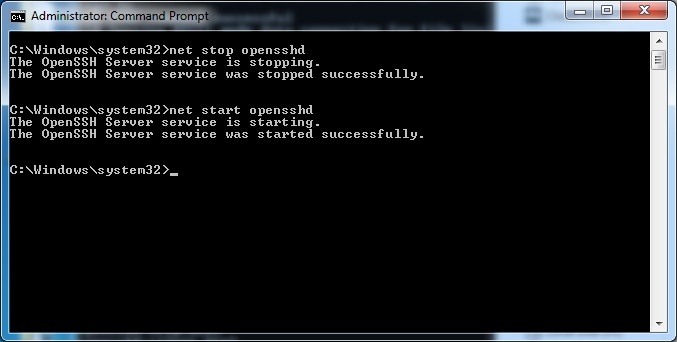 If you installed the openssh server, it will start automatically after the installation completes. You can also stop/start the openssh service from the Services control panel applet. If you experience problems with the service, look in /var/log as it might have a clue why the service is failing to start. The original source code for sshwindows came from SourceForge.net.